Of all the projects my center, the Nonproliferation Policy Education Center (NPEC), has undertaken, none has generated as much high-level attention as the contents of this volume–four histories of disturbingly close calls when governments came close to losing control of their nuclear arsenals during political crises. Certainly, the number and seniority of current and former officials attending the rollout of this research by my center and the Foundation pour la Recherche Stratégique was impressive: an Assistant Secretary of State; the national intelligence officer in charge of Southwest Asia; a former International Atomic Energy Agency (IAEA) deputy director for safeguards; two former members of the National Security Council, and several senior staffers from State, Defense, Energy, and the Central Intelligence Agency (CIA). The officials’ interest in these histories is understandable. Accounts of nuclear security crises that have taken place outside of the United States have generally been cloaked in secrecy. Also, the drama associated with these crises is significant. At the height of the Cultural Revolution, a Chinese long-range nuclear missile was fired within the country, and the nuclear warhead it was carrying detonated. A French nuclear device was exploded in Algeria during a coup. When the Soviet empire collapsed, shots were fired at a Russian crowd intent on rushing a nuclear weapons-laden plane straining to remove a stash of nuclear weapons to a safer locale. Pakistani governments have been routinely pushed aside by a powerful nuclear-armed military. But expert observers worry that in the future, Pakistan's powerful military might be divided against itself or held hostage by some faction that seizes control of some portion of Pakistan’s nuclear assets. How could one not be interested to learn more? Yet, for all of this, it is unclear just what these stories teach. It certainly would be a mistake to assume that they impart a list of specific policy prescriptions. With each case–the Algerian coup of 1961, the collapse of the Soviet Union, the Chinese Cultural Revolution, and the series of Pakistani crises dating back to the 1980s–the circumstances were so unique it is difficult to draw recommendations that would be very useful today. The reasons why are nonintuitive. First, the technical challenges each government encountered and the fixes they employed to maintain control over their arsenals were not only different in each instance, but arguably unique to the era when the crisis occurred. Whatever specific technical solution a government might have employed to prevent a past nuclear security crisis, then, is not necessarily the one another would be advised to use today. Second, and far more important, each and every nuclear security crisis is and will always be driven by a unique set of human actors, individuals, or groups whose thoughts and intentions, both then and now, are largely beyond anyone’s ability to precisely pin down. This presents an immediate historical challenge: How does one determine or prove what key individuals thought or intended to do in the past when it may be in their interest now to embellish or lie? This matters enormously since no matter how “secure” one tries to make nuclear weapons assets procedurally or technically, individuals with enough authority or access can elect to override or find ways around such protections. The political and organizational solutions employed successfully in the past, therefore, may or may not work in the future. Such uncertainty is bewildering, because enhancing the nuclear security of existing nuclear weapons arsenals and nuclear weapons-usable materials and plants is a high priority. Hundreds of tons of military and civilian nuclear weapons-usable materials are added to the world’s total every year, and the number of new civilian nuclear plants continues to grow. It would be a relief to know that these materials and plants could be rendered safe against theft, seizure, or sabotage. Of course, one can do better or worse at providing nuclear security, but the history of close nuclear security calls suggests that as long as there are assets that can be diverted to make nuclear weapons or sabotaged to produce environmental disasters, there will be no absolute fix to prevent the worse. There is, however, a silver lining to this history that more than justifies our fascination with it: The more we learn about past nuclear crises, the healthier our dose of fright. At a minimum, this history reinforces the imperative to avoid such crises in the future. Certainly, had any of the past nuclear security crises detailed in this book gone differently–had the rebel faction of the French military seized the nuclear device that was to be tested in Algeria, had the nuclear-armed missile the Chinese fired and exploded during the Cultural Revolution hit a city, had the Russians lost control of the weapons they were evacuating from remote bases to hostile local forces, or had the Pakistani government ever lost control of its weapons to irredentist forces–each of these governments would likely have collapsed. 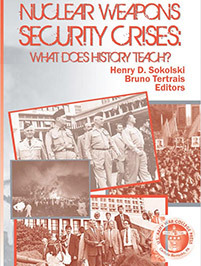 In addition to detailing the nuclear security crises that took place during the French Algerian coup of 1961, the Chinese Cultural Revolution, the collapse of the Soviet Union, and Pakistan’s persistent political instability since the 1980s, this volume showcases analysis of this history by a series of distinguished nuclear experts and practitioners. The hope is that history and its lessons will help in support of preparations for the next Nuclear Security Summit, planned for the Netherlands in 2014. Next year, my center plans to publish an additional volume of historical research it has commissioned on known instances of large amounts of nuclear materials useful to make bombs that have gone unaccounted for (known as material unaccounted for [MUF]). Several cases will be examined. These will include the loss and possible theft by Israeli agents of at least 100 kilograms of weapons-grade uranium in the 1960s from a nuclear plant in Pennsylvania; the scores of bombs’ worth of plutonium gone unaccounted for in Japan and Europe since the 1980s; the hundreds of bombs’ worth of weapons-grade materials gone unaccounted for from U.S. nuclear weapons plants operating during the Cold War; and the challenges of accounting for South Africa’s past production of nuclear weapons uranium. Given the continued military and civilian production of such materials today and the efforts to cap them, this history should also be instructive.